Take care of your hair from the inside out. 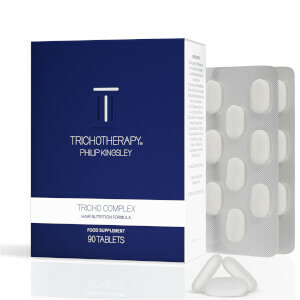 The Philip Kingsley Root Complex is a hair nutrition formula packed with a cocktail of vitamins and minerals. Ideal for those wanting extra daily nutritional support for hair, the hair supplements provide key nutrients, including Omega 3, Silica, Vitamin D3, Vitamin E and antioxidants; perfect for diets lacking in Vitamin D3 and essential fatty acids. The first delivery system of its kind with this blend, the innovative 'pill in pill' supplement contains an inner capsule of dry ingredients suspended in an outer casing of oil ingredients. This helps to optimise absorption for maximum effect. Developed by the brand's expert trichologists. Not suitable for vegans and vegetarians. Take two tablets daily, one with breakfast, one with lunch. After 6 months, reduce your dose to one tablet per day in order to maintain optimum levels. Do not exceed recommended daily intake. Take with water, immediately after food. We recommend taking Root Complex for a minimum 12 weeks.